Sales is a tough, unpredictable business. Managers demand constant progress reports from their teams. Sales professionals find ourselves explaining (or excusing) why a pursuit isn't further along, pipelines aren't growing more quickly, or new prospects haven't been approached. It's enough to make even the most confident people downright insecure. Sometimes there is a need to make a change in order develop effective selling techniques. And if others have noticed that you're in a rut, then you've probably gotten plenty of advice about what to change. But once you've identified an improvement you want to make, how do you go about it? What's the best way to make a change stick? In a recent interview on the Harvard Business Ideacast, Daniel Goleman, the author of the organizational masterworks Emotional Intelligence: Why It Can Matter More Than IQ , reflected on making a change successfully. 1. Find Motivation - Do you care? First and foremost, you got to find the drive to change. It's always tough going in the beginning of any transformation- there's a lot of historical momentum to overcome. Draw on your dissatisfaction with the past and visualize a much improved future of effective selling to keep you moving forward. 2. Acquire Knowledge - Do you know what to do? A clear vision of your end goal is not enough. You must understand how to get there. Get the right advice, learn from successful people, read everything you can about the change you want to make. Find out what the milestones look like along the path to success. 3. Collect Feedback - Do you have people who will give you an honest critique? It's hard to judge your own progress objectively. Enlist the aid of people you trust- and who care about your success- to tell you how you're doing. Ask for both positive and the negative feedback in equal amounts. This will help you improve while limiting your chance of getting discouraged and giving up on your goal of effective selling. It's never easy to make a change, but the ability to improve yourself is what separates effective sales people from those who aren't. Tom Hanks put it best in the movie, A League of Their Own: "It's supposed to be hard. If it wasn't hard then everyone would do it. The hard is what makes it great!" What sales habits would you like to change? What pains are "bad habits" causing you? 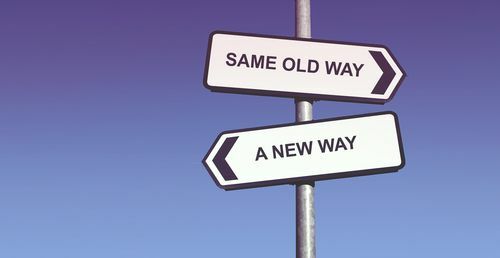 What difference could a change make for you?